Today I’m happy to say completes 14 days into my anti-inflammatory journey. The benefits I have experienced have been nothing short of amazing for me. I’m finally losing the weight, no joint pain and my skin is looking much better. 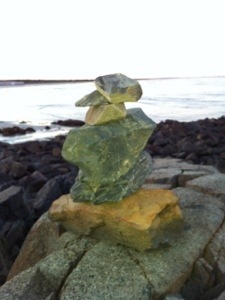 I’m finding more energy and I see and comprehend things much clearer. What I finding to be very exciting is what I can’t see that’s going on inside. I’m sure my body is in extreme repair mode. I guess that because I do have some periods of exhaustion and after what I’ve put this body through with years of unprocessed foods, I would be exhausted too. I started with an article from vegetarian magazine that turned me on to JJ Virgin’s book. From her book I found a wonderful challenge. Seven days, seven foods, lose seven pounds.Then I was at the book store and saw Dr. Andrew Weil’s magazine/book about the anti-inflammatory diet. educations makes all the difference. Now I have one more week to go before I start adding in one by one the seven foods I took out. Honestly, I’m good. I really don’t have any one of the foods I want to put back in. I’m considering eggs but so far so good without them. The real challenge has been reading the labels and making sure non of the seven foods are in anything I consume. The one food I think is the real culprit? Gluten. There is no doubt in my mind. dairy is the close second. For almost six weeks I had a cough that wouldn’t go away. My doctor said it’s going around and you have to wait it out. I hate taking over the counter meds but this cough was annoying. I was hooked on Mucinex DM. It really was helping but I was taking it like a multi vitamin. Once I started this new way of eating, within three days, the mucus and coughing stopped. I mean completely. I woke up one morning and realized I didn’t cough all night and I didn’t have to clear my throat. That was my first good sign. The second was I noticed no joint pain in my knuckles. This is pretty cool. There’s something to this new “lifestyle”. I’m fortunate to have a supervisor at work who is doing the same thing as I am. The fact that he’s an excellent chef is simply a bonus. I think the hardest thing is to make dressings for salad. After a few discussions and bouncing ideas back and forth, he had some pretty good suggestions. Sometimes a dressing is as easy as fresh lemon juice or a quick Dijon dressing. use olive oil and whisk in some Dijon to make it creamy and then a little cracked mustard seed dressing for fun. There are some really good balsamic vinegars out there as well. This whole new eating lifestyle is about taking fresh whole foods and creating what you want. Even a fresh squeeze of an orange with balsamic can be a nice treat on a salad. 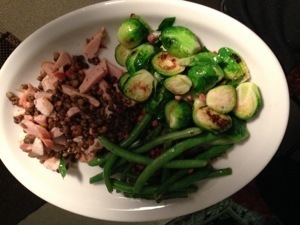 For dinner tonight I had roasted Brussel sprouts, sautéed green beans, turkey breast and lentils (see picture). It was more than enough. It was wholesome and delicious. Eating healthy actually can be affordable. We’re coming into farmers market season. I can’t wait. In the mean time I find Trader Joes is very helpful place to shop. I buy my organic beans there as well as almond butter, avocados and apples. Another tip is to go to the various organic companies and print our their coupons. That’s been a big savings. I drink unsweetened coconut milk and love organic greens. There are coupons for them online. Since I have the room for my own little garden, I’m going to grow the vegetables I need to juice: Kale, parsley, spinach, cucumbers and beets. Luckily I live in New england and we’re still expecting snow this week, so I have time to finalize a plan. One of the hardest things about doing all of this is trying to explain it to people you love with hopes they will give it a try. It’s like any life change. Just because it works for you doesn’t mean everyone else is ready. All you have to do is just share what you’re experiencing and then maybe it can be helpful. I guess in time. It’s all about education. Sharing Dr. Weil’s magazine has been a nice way to give someone the choice. Facebook is a good tool for posting articles and various stories about anti inflammation. In the meantime, I’m very happy with my new lifestyle. I feel healthy. 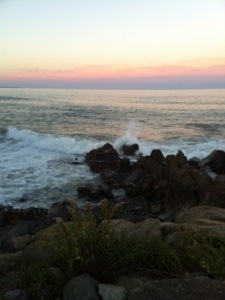 My walks are more vigorous. My nights are relaxing with a new article or writing some new recipes. I have a book ready to be published with gluten-free and dairy free recipes that will make your life so much easier and taste better. Now I have the motivation to write a new book with recipes for the major allergens. I’m a chef who has been given the gift to create recipes for people who thought they could never have their favorite foods again. This is a gift I love to share. Sometimes it all starts with an article. Then by just applying it for one day at a time, you can accomplish more than losing a few pounds. Making the effort seemed like a big accomplishment for me. After completing 14 days, I have one more week to go to finish the twenty-one days. Life is good and staying on this path means it’s just going to keep getting better. Tags: allergies, dairy free, education, food, gluten free, inflammation, inspiration, journey, magazine | Permalink.